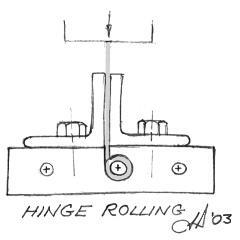 Hinge Rolling Die: This is a common small press operation suitable for arbor press, fly press and punch press. The die has a hole drilled with a tangent slot for the material entry. 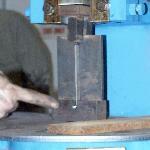 The hole continues through another unslotted piece that supports the mandrel. The two pieces are doweled for alignment. Guides (made of angle iron in this example) support the hinge and act as a stop. 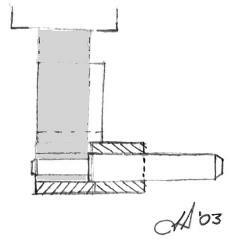 The mandrel serves two functions, one for the metal to wrap around and the other to push the rolled hinge out of the die. For long hinges such as strap hinges it would take a rather unweildly arrangement of tall press and long guides. But for short hinges this is one of the fastest ways to make the hinge loop. 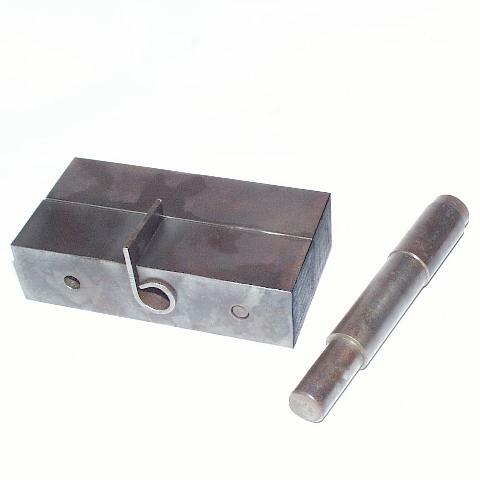 Punch presses and fly presses are commonly used to notch, punch and blank hinge parts as well as roll eyes.